Enterprise flying near the Woolworth Building in Lower Manhattan, from my apartment rooftop April 27, 2012. I hear the soft slaps of my father's burgundy Papa-slippers as he walks down the hallway to its end, then slowly turns around and paces back. Over and over. Back and forth. With 3-year-old me riding piggyback, or o-boo-ba, as my Korean mom would say. It is the middle of the night and I can't breathe. The asthma medicines in 1961 were not helpful. There was some yellow, icky-tasting liquid that I recall. The only thing that made me feel better was getting a piggyback-ride and gradually falling asleep as my shallow, rapid breathing synchronized to the steady rhythm of fatherly slippers. It's one of my earliest and most vivid memories of Papa, who died when I was a teen. I could've used an o-boo-ba this past week when I landed in the hospital for asthma, but Papa's not around anymore and I'm a grown-up adult. Still, it would've been more comforting than the massive amounts of corticosteroids that made me jittery and the Ambien that gave me nightmares. Although I must say, steroids do the trick. Thank you, science, for better daily medicines, which should keep most asthmatics - those who receive consistent health care - out of the emergency room. My problem is that I'm allergic to just about everything on this planet, and this was a particularly bad allergy season. I think the only thing that would really help my health, but at great injury to my sense of style, would be if I were to go about my day in an air-conditioned, HEPA-filtered spacesuit. Asthma can be debilitating to people in varying degrees. There was New York Times foreign correspondent Anthony Shadid, born in Oklahoma City like my husband, who died of uncontrolled asthma triggered by an allergy to horses when he was crossing the border out of Syria. Then there was Teddy Roosevelt, who overcame his childhood asthma by exercise and sheer willpower, which, frankly, I find annoying. After having read more about Teddy Roosevelt recently, I can say that TR was a maniac. Do not compare me to TR. I will never be able to overcome asthma to lead an expedition into the Amazon jungle, nor could I continue with a speech after having been shot and the bullet still lodged in my chest. I can't complain about asthma and do not. My father passed on the genetic disposition to me and my siblings - the five of us - but that's just how it was. My parents never thought of us as growing up to careers requiring healthy lungs, like athletes or florists. The life of the mind was the ticket, with its infinite possibilities. We may have been fragile and earthbound, but our imaginations were lifted aloft by literature, music and science. And yet, early on I vowed never to have children because I did not want to watch my child gasp for air while I stood by helplessly. Now, I wonder. But I had my busy career, and met my Oklahoman late in life, and there you have it. We are quite happy without kids. Except that we do have a darling child, who happens to have four legs and a tail. On Friday, the day after I got out of the hospital, I was breathing easier but still feeling pretty low. Then something happened that sent my spirits soaring. 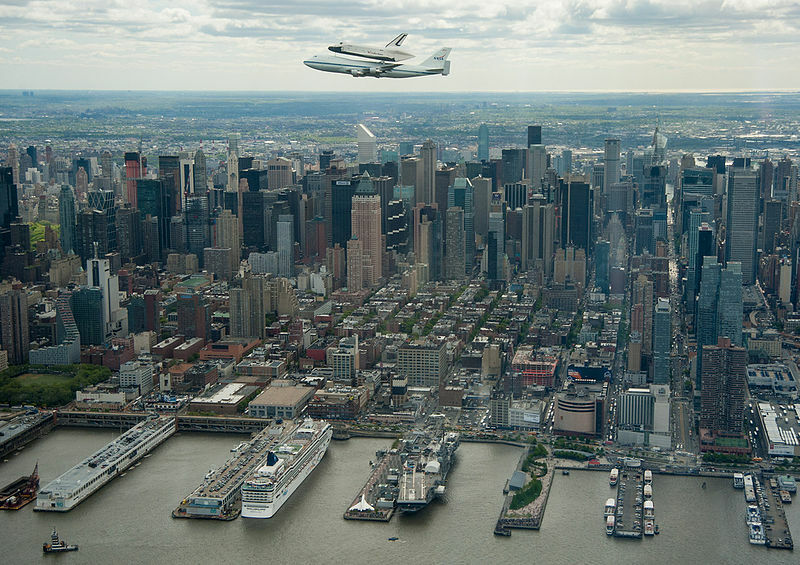 The Space Shuttle prototype Enterprise was making a special last fly-by over New York City. I was tired but there was no way I would miss this. It represented my father's aspirations in space exploration as a scientist and a classic Star Trek fan, which he also passed on to me. I went up to the roof of my apartment building in Lower Manhattan to watch for her. The skies were a beautiful blue with soft white clouds, and the bracing fresh air soothed my lungs. There was a joyful hoopin' and hollerin' from people all around as Enterprise came into view. Then everyone in this busy city just stopped what they were doing to look up, eyes wide and hearts full of pride at this universal symbol for transcending earthly constraints. 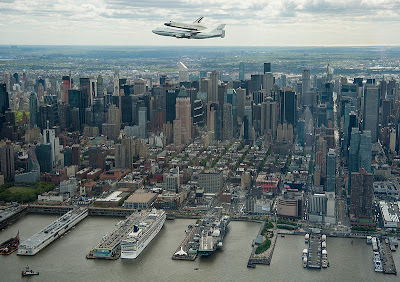 Hitching a ride on the back of a jumbo jet, Enterprise flew triumphantly from the Statue of Liberty up the Hudson River, turned around by the George Washington Bridge, and then flew back down again. An o-boo-ba! What a beautiful, beautiful connection. Lovely. What a fine metaphor. I'm sorry to hear you were hospitalized, though. While doing my laundry last weekend, I overheard a strapping young man who looked the picture of health tell his friend he'd had to take several days off work the previous week because of the pollen. He said the saturation was "more than 100%" - not sure how that's possible, but it was terrible. So glad you're breathing easier. Be well! Thanks so much for sharing this beautiful piece with us. Even though I wasn't in NYC, the photos and videos of the "o-boo-ba" shuttle stopped me in my tracks and appreciated what human ingenuity and cooperation can bring forth. A wonderful tapestry, so rich with threads. I'm sorry for the incident that inspired it, but thank you for writing it. This is a lovely, poetic piece. TY! Beautiful account. I too am amazed that TR traveled around the world with asthma. I won't go for an overnight trip without a nebulizer. Your memories really touched me. Darwin is one lucky son. Very enjoyable blog post! Great to hear the first-hand account of Enterprise, and the connections you made with memories of your father. I hope you feel much better soon! Wonderful writing! I loved your reasoned resistance to try to compare your coping with asthma with TR's way of dealing. Bully!